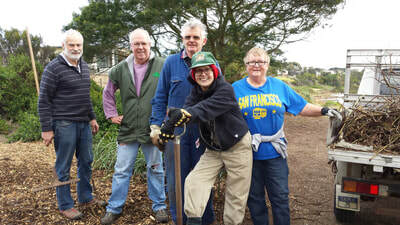 Foreshore Highlights is a monthly e-newsletter emailed to subscribers. 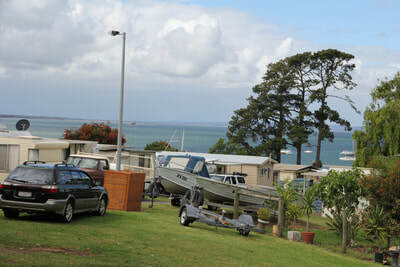 ​See the new Foreshore Highlights page for more details and to subcribe. Past copies can also be downloaded. for details see Working Bees page. 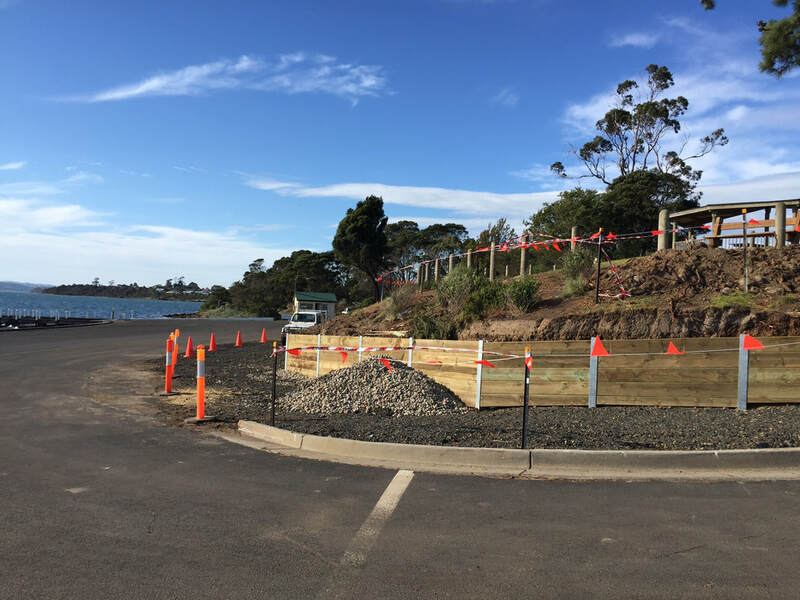 SMC Marine Pty Ltd have been announced as the successful contractor following the tender process to find a suitable marine construction firm to redevelop the Corinella Boat Ramp facility. 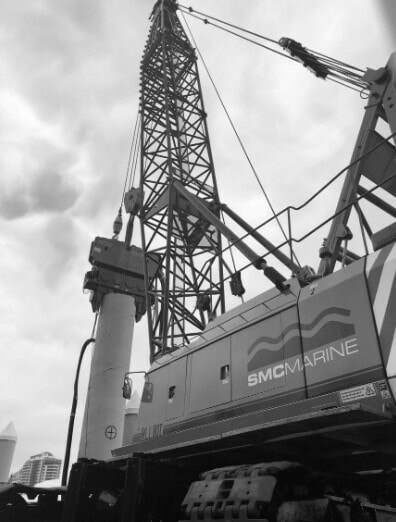 SMC have a sound history of successful maritime construction projects including the recent completion of the Port Welshpool Long Jetty. For more information, and to subscribe to regular update on the construction, please see the Ramp Facilities Upgrade Project webpage. Top left and left: Tim demonstrates how to furrow the ground and spread the bait. in the morning, cover the furrows over again to bury the bait. Above: The number of rabbit droppings on a mound indicates the degree of rabbit activity in the area. 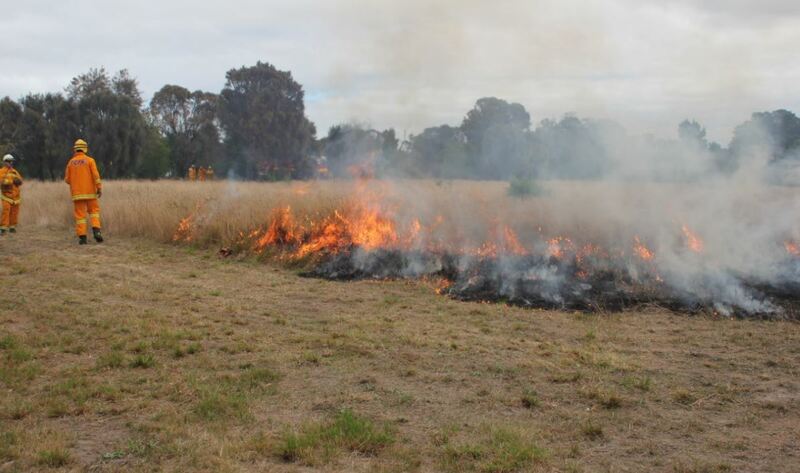 Community members may recall the Rabbit Information Session held in August 2018, with noted feral animal expert Tim Bloomfield presenting a fascinating overview of rabbits, how destructive and prevalent they can be, and how to control them. 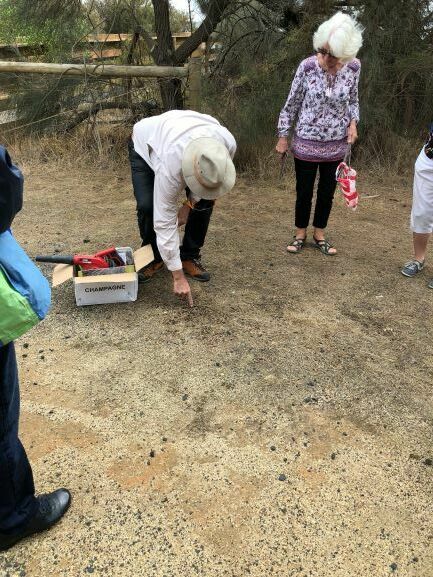 Tim returned to lead a field excursion on Saturday 6th April, taking a group of interested community members out onto the reserve at Settlement Point for some practical tips on rabbit management. 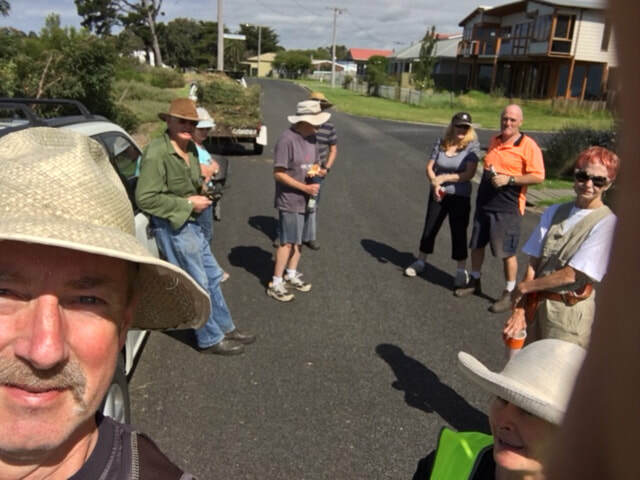 This followed a short lunch at the Community Centre where people were able to have a chat and ask questions before heading out onto the reserve at Settlement Point. ​Below: Tim demonstrates how to smoke out a burrow to find other exits. He uses a special smoke generating blower down a burrow, and the smoke will come up at other entry points. Small flags are then used to mark other exits. 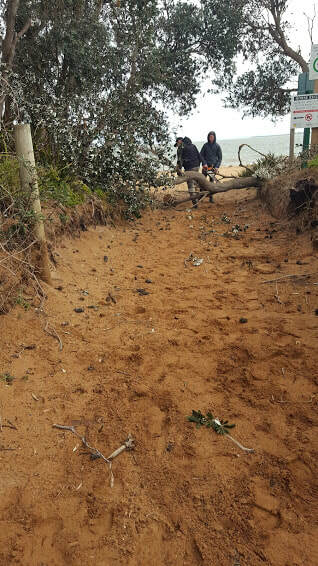 Work has recently been completed around the reserve to manage and remove a number of broken and damaged trees and limbs. Community members may have spotted the arborist contractor from KC TreeCare at work. A number of the tree limbs had broken but were caught in their trees, and required harness work to access and safely remove them. Most of the debris is mulched. Several committee members also helped out working to remove some of the smaller pieces of debris. ​See Kevin in action (right). The newsletter states “People shouldn’t deliberately approach dolphins closer than 100 metres in boats, 300 metres on Jetskis or 30m for paddlers and swimmers”. The newsletter goes on to say that its ok if the dolphins approach you, and if a vessel, ideally stop or slow down if safe to do so. More information about the regulations is available on the Dolphin Research website at www.dolphinresearch.org.au and a copy of the newsletter is available here. 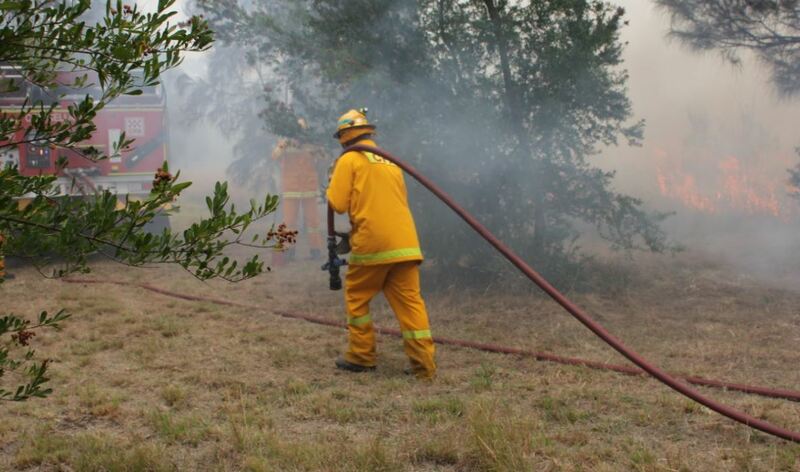 The Country Fire Authority has an ongoing place in monitoring the foreshore reserve. A walkthrough the reserve is organised according to their recommendations, and the CFA assess the state of the foreshore reserve in terms of fuel load. The most recent assessment occurred in December 2017 and their feedback is available to download (right). It notes the low risk nature of the landscape and vegetation, and supports the maintenance schedule in place. 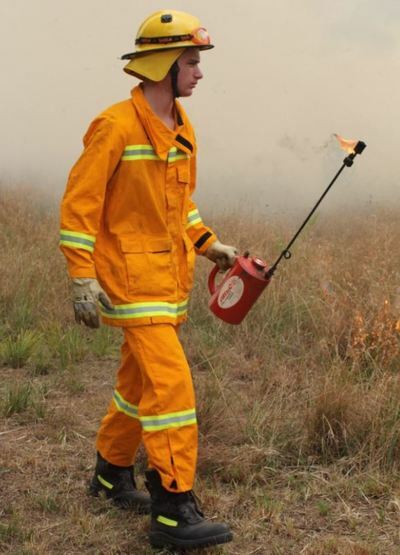 Although it recommends a further review in 3 years time (ie 2020) a further review by the CFA was requested in late 2018 and is still pending.The report and any recommendations will be published once the CFA have completed their review and forwarded their findings. See Tim Bloomfields presentation below for details of the rabbit management session. 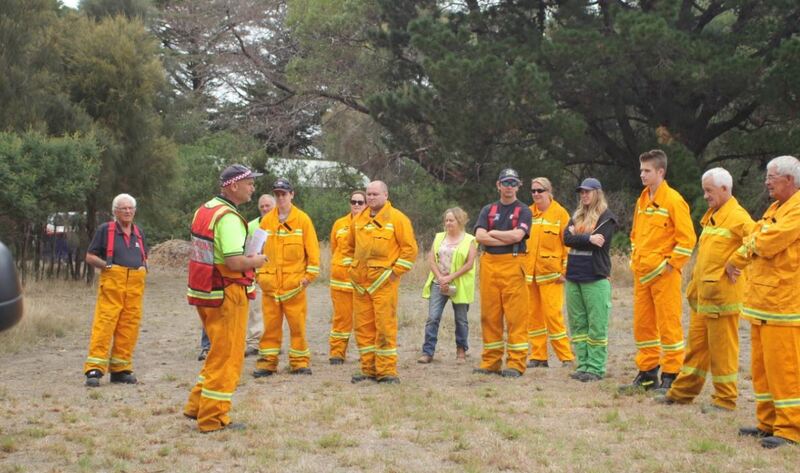 Around 30 people attended the Rabbit Management Information Session on Saturday 25th August. Tim Bloomfield, noted expert on feral animals, gave an engaging presentation and answered many questions on the management of rabbits. ​Rabbits love freshly mown grass so will be especially attracted to residential properties in Corinella. Tim answered the question many have about 'bush rabbits vs warren rabbits'. 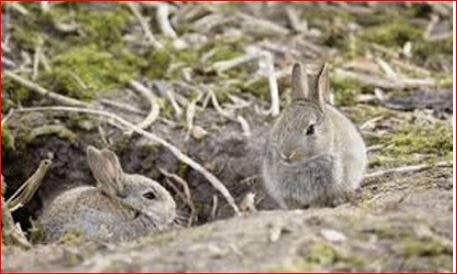 Rabbits are born without any fur so need a burrow to survive the cold & predators. Some rabbits will create a shallow burrow for their young, others will create an extensive warren, and this can depend on the type of soil. Look for rabbit dung and scratchings. There may be a slight rise where the burrow is located and all the grass/feed will be eaten around the entrance. He advised rabbits quickly adjust to shooting and will simply hide when they hear humans or guns, so not very effective. Baiting and ripping should be used together. Baiting will eradicate a portion of the population, those that survive can be controlled through ripping the burrows (and then compacting the area to stop them re-establishing the burrow or warren). They will weaken and be more susceptible to the baiting program. Doing rabbit counts helps monitor progress of any control programs, and should be undertaken prior to the program commencing. Feral Scan is an app that can be used on your phone to record rabbit sightings and burrows. It is an Australian Government initiative to record feral animal sightings to inform research. You can register your details, and upload sightings, location of burrows, dung and upload photos. You can also share the location so others in the area can see the sighting information and it will build a map showing rabbit distribution. You can also use it for other feral animals (foxes etc). February is the best time to bait, when there is not a lot of feed (grass) around. When using oat bait, always dig a long trench. Rabbits will be attracted to the overturned soil. Piling it in one spot will allow one rabbit to fight off others for the feed, so always spread it out. Need at least 5-6 days of feeding. Use plain oats first to see if rabbits will feed (so you're not wasting the bait). If you find dead rabbits, put them in the bin to stop animals feeding on them. 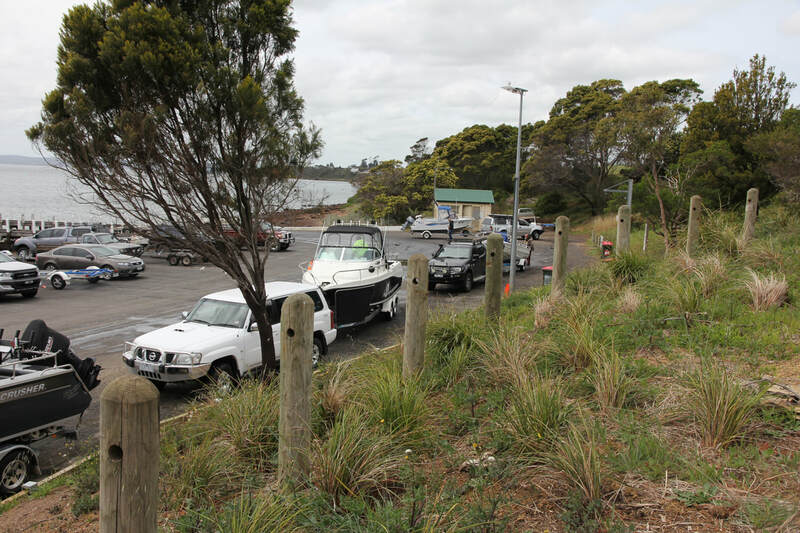 The Treasurer, Tim Pallas today announced funding of $1.41m has been granted to the Corinella Foreshore Reserve Committee of Management to fund the Boat Ramp Facilities Upgrade. 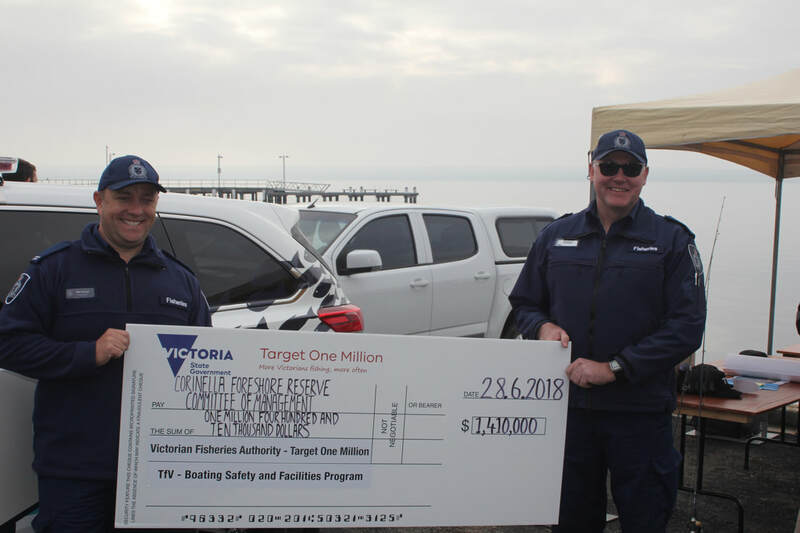 $1.16m is being invested by the Andrews Labour Government from the Transport for Victoria's Boating Safety and Facilities Program. 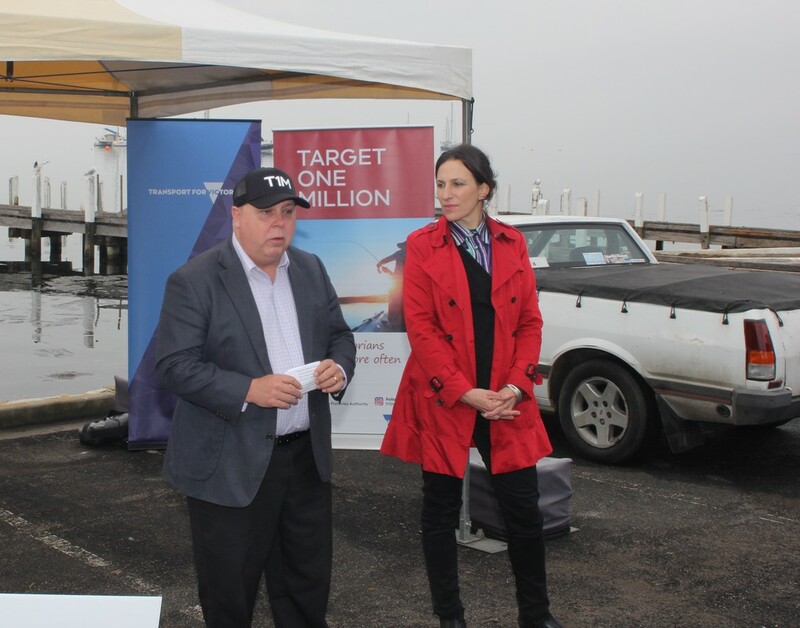 A further $250,000 is allocated from the Target One Million plan. 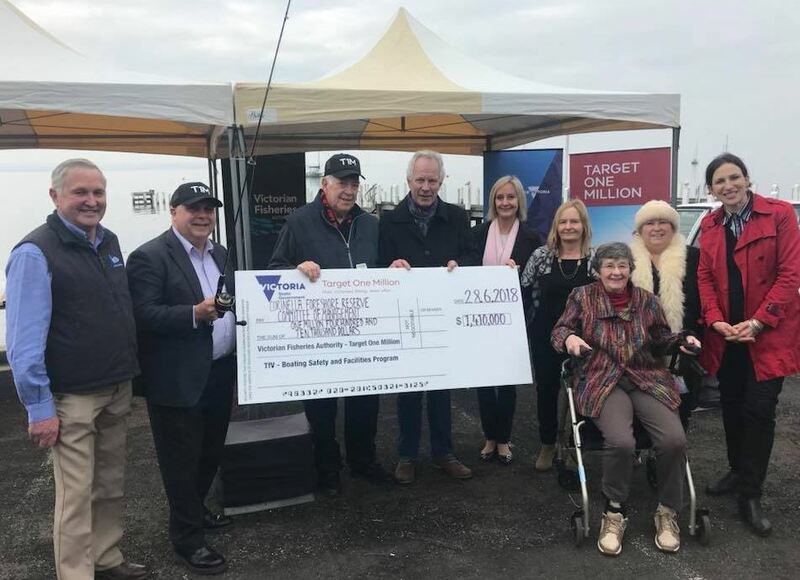 The announcement was made at the Corinella boat ramp with representatives from Victorian Fisheries Authority, VR Fish, Corinella Boating and Angling Club, along with State Treasurer Tim Pallas, Jordan Crugnale the Labour candidate for Bass, and members of the Foreshore Committee. 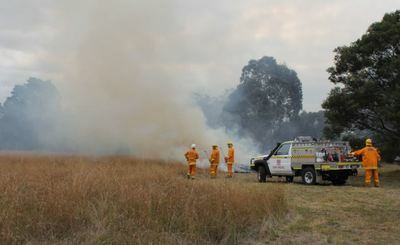 9 News Gippsland and Win News also took interviews (see video top right). 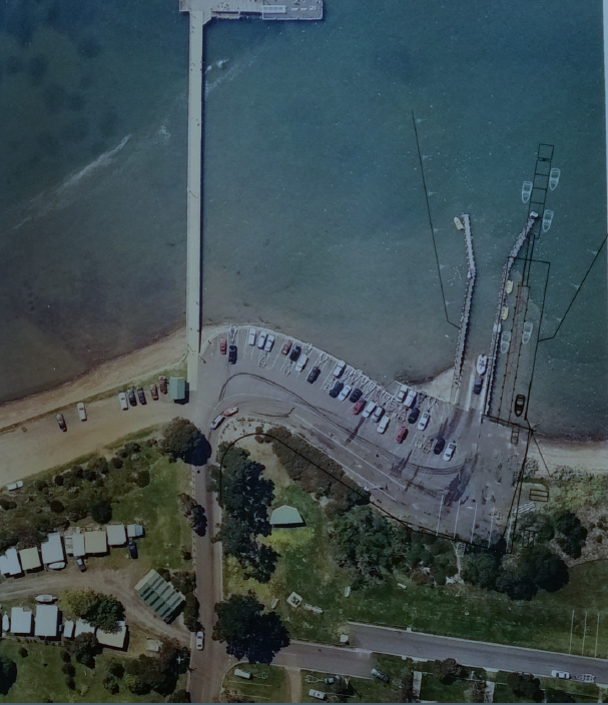 The upgrade will include 2 new ramps, a new finger jetty and floating pontoon (replacing the aging eastern jetty), new fish cleaning facilities and improved parking and traffic management. The new facilities are expected to commence construction in May 2019. ​Track progress and the latest information, and subscribe to a mailing list for e-newsletter via the Ramp Facilities Upgrade Project webpage. Top: Treasurer Tim Pallas (centre) and Jordan Cugnale. 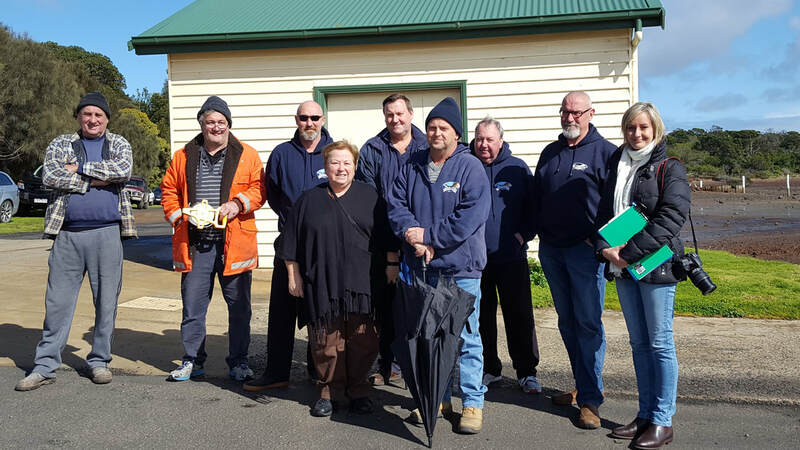 Above: From left, Rob Loats (Chairman VR Fish), Tim Pallas, State Treasurer, Joe Ford (Committee), Michael Johnson (Committee Chair), Gloris Willoughby (Committee), Barbara Oates (Secretary), Anwyn Martin (Former Chair), Lyndel Parker (Committee), Jordan Cugnale (Candidate for Bass). 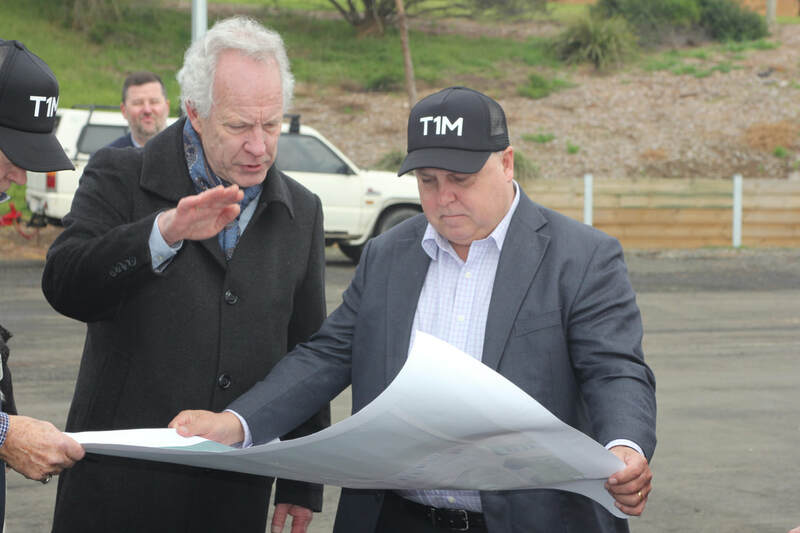 Top: Michael Johnson, Chair of the Corinella Foreshore Reserve Committee of Management, discusses the upgrade plans with State Treasurer, Tim Pallas. Walkers frequenting the Northern Precinct walk will now see a new sign in place with information about the importance of our shore habitat. 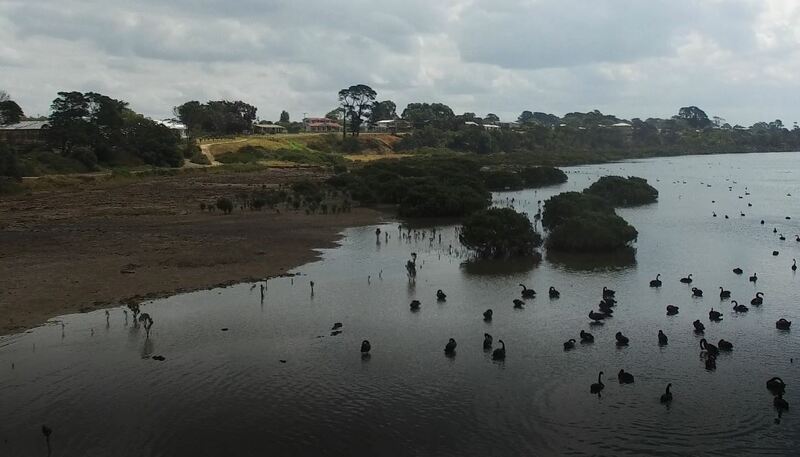 Western Port is an important place for many migratory shorebirds including black swans, and we all have a role to play in helping protect them. will make a difference in protecting this important habitat and keeping it safe for many species of shorebirds. Dogs off lead are a threat to shorebirds and can often be seen chasing birdlife along the beach. 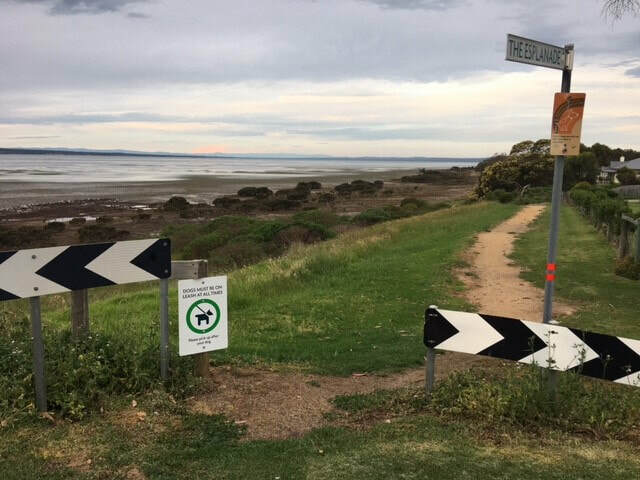 There is a great dog beach on the southern side of Corinella between Beach Street and O'Connor Road (signs are in place to indicate the stretch of beach), and dog walkers are encouraged to use that area to run your dogs. 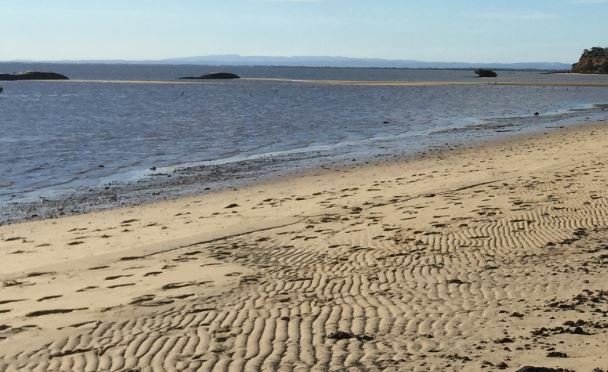 Several committee members attended the recent Coastcare Ecology and Management forum, held over the weekend of 7th and 8th April. 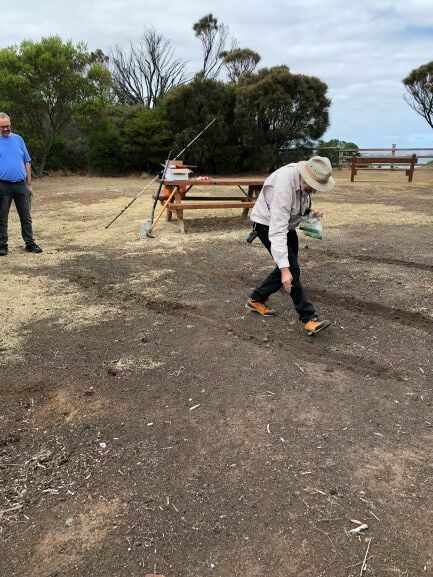 Held at Kilcunda, the program included presentations on a range of topics including weed control programs at Harmers Haven foreshore, traditional indigenous knowledge and ecological change, Protecting the Powlett River Estuary, and Victoria's marine biodiversity. 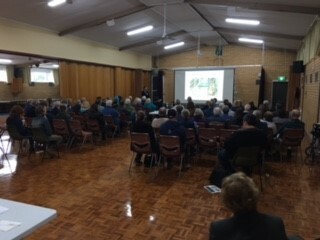 Guest speakers included Alison Oates (ecologist), Neville Rosengren (geomorphologist), Kent Stannard (great white shark researcher), Terrie Allen and Margaret Barnard (Wonthaggi nursery and seedbank), and Mark Rodrigue (Parks Victoria). 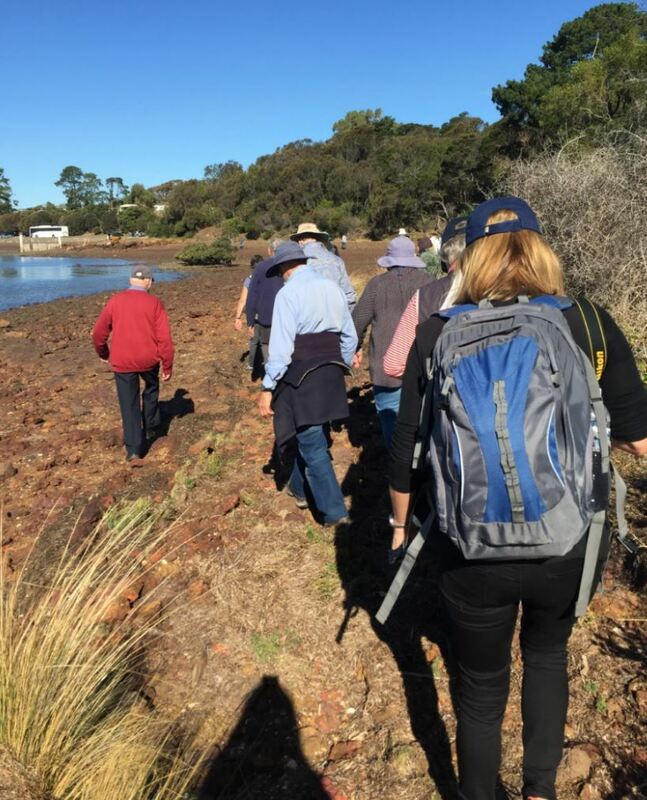 Field trips were also part of the program, with a bus trip along the Western Port shoreline vising Corinella's rock platform below settlement point, Jam Jerrup beach, and Bass River mouth with Neville Rosengren providing expert insights. The field trip focused on the geomorphology of the area, and how the coast was formed and how it changes through movement of sand, influence of human intervention, and through natural processes and climate change in the past and present. 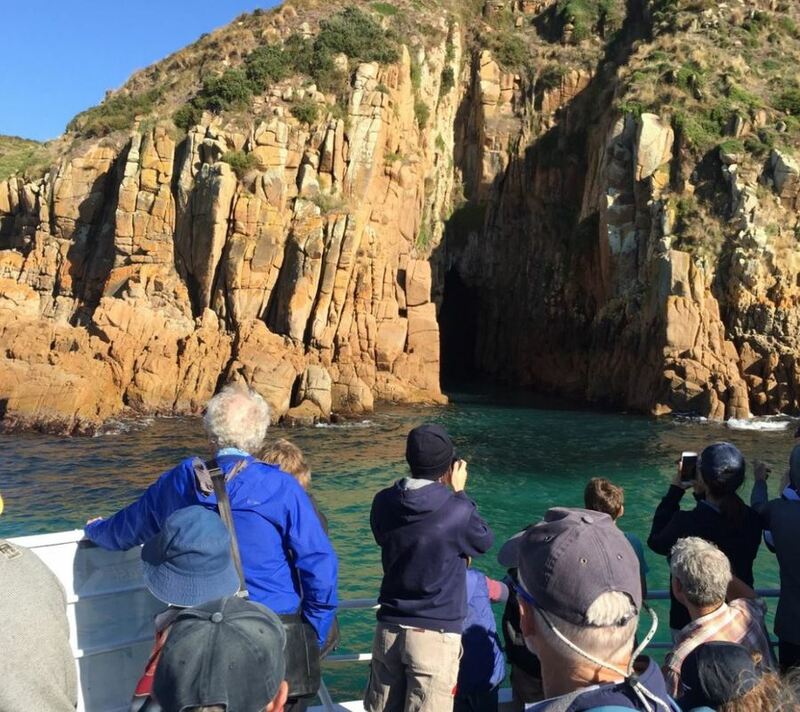 Sunday mornings field trip was a boat trip around Cape Woolamai aboard the Brianna Lee to view the cliffs, caves and vegetation around the coast, with commentary by Neville Rosengren and Alison Oates. This was followed by a walk around the top of the cliffs with further commentary. 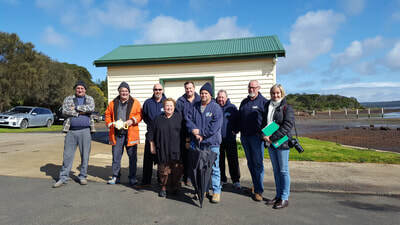 Overall a very informative weekend, with participants from around the state from committees of management and other groups associated with care of coastal or ecological areas or related functions. As always, it was an excellent opportunity to share ideas, learnings, and renew connections. Photos Centre: (Top) Gloris Willoughby, Barbara Oates, Jean Jacques (JJ) Pantebre and Jenny Lawson enjoyed the workshops and field trips. 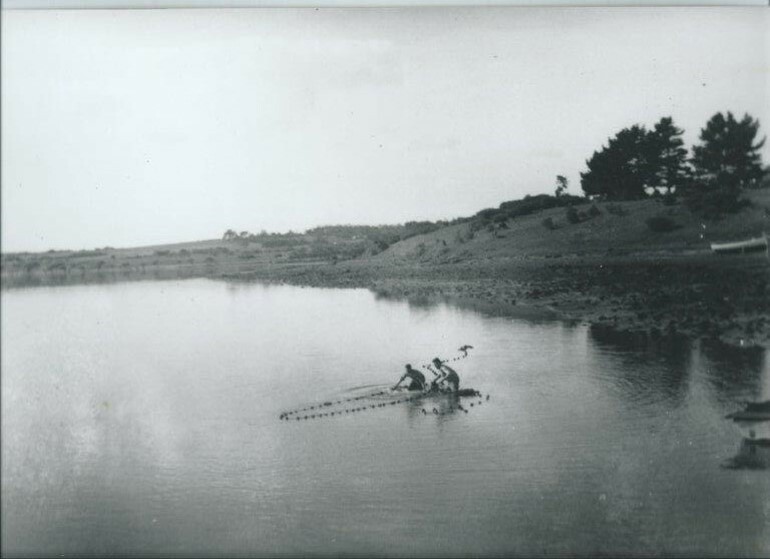 Centre and Bottom: Exploring Corinella's rock platform and how it was formed from volcanic activity, with Neville Rosengren. Photos Right: Top photos: Jam Jerrup man-made sand islands, causing sandbridges to form; and boulders dumped below the cliffs causing increased erosion to either side. Bottom photos: Bass river now being encroached by mangroves as the sea level slowly rises; the cliffs approaching Cape Woolamai. The planned environmental burn on the Settlement Point Oval was completed successfully on Tuesday 3rd April 2018. The purpose of the burn is to remove the build up of western weeds and grasses, including the build up of mown grass on the oval. This allows the native grasses and wildflowers to flourish. It will look spectacular within a few months. A crew of around 16 CFA volunteers from Corinella, Kernot/Grantville, Dalyston and San Remo gathered at the oval to assess the conditions - weather, wind, humidity. They were highly organised, with maps and instruments. 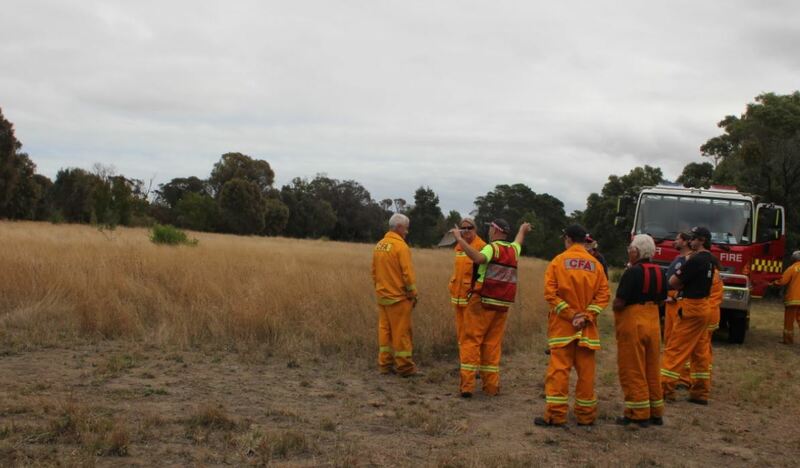 They held a detailed briefing session and took time to walk the entire oval, inspect the surrounding vegetation, the mown area around the oval, and become familiar with the surroundings. They donned their gear and and set out the required equipment. As it was very overcast, they waited for a while for the cloud to start burning off so that the smoke would clear rather than hanging over the town. Conditions were soon suitable for the burn to commence. 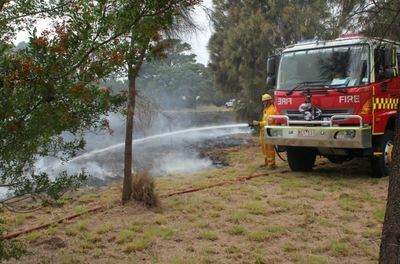 Two firetrucks and two four-wheel drive appliances were manoeuvred to four points around the oval and hoses were prepared. 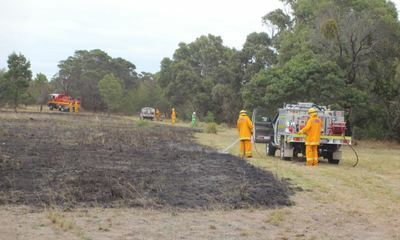 With crews in place at strategic points, the burn commenced at the northern end, against the prevailing south westerly breeze. 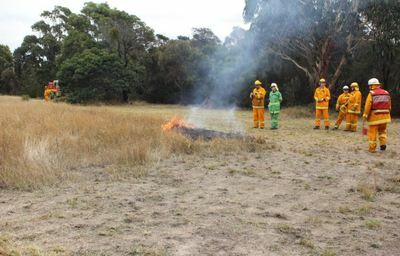 The burn slowly proceeded across the north-western end of the oval and gradually burned across to the southern end and then towards the western end of the oval. The crew followed the burn around the edges and stood by with hoses, and then started to douse torched sections. The burn took around one hour to complete. Crews walked around and across the area to inspect the job and ensure everything was extinguished. Eventually the appliances were packed up again, and the crews rolled out to the BBQ area near the caravan park. 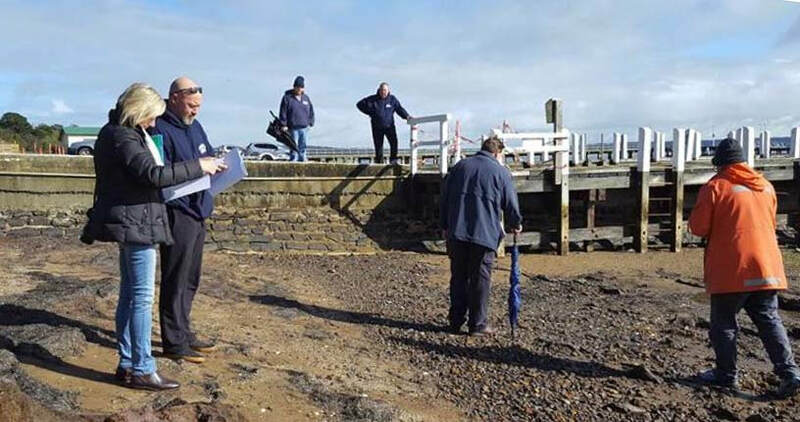 There they enjoyed sandwiches provided by the Foreshore Committee, and they held a debrief session where they discussed and reviewed the operation and its outcomes. The committee would like to thank the CFA crews from Corinella, Kernot/Grantville, Dalyston and San Remo for their support and professionalism in carrying out this burn. 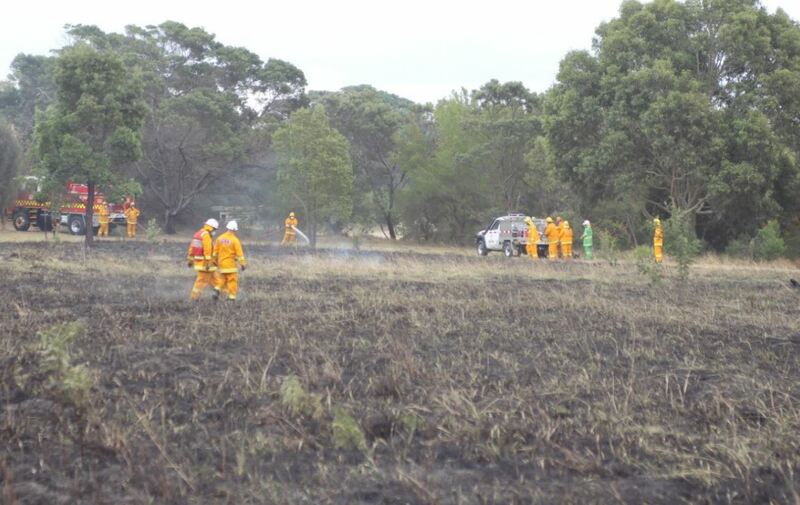 Our beautiful reserve has been subject to a pointless attack on a young blackwood tree in the Western Precinct. 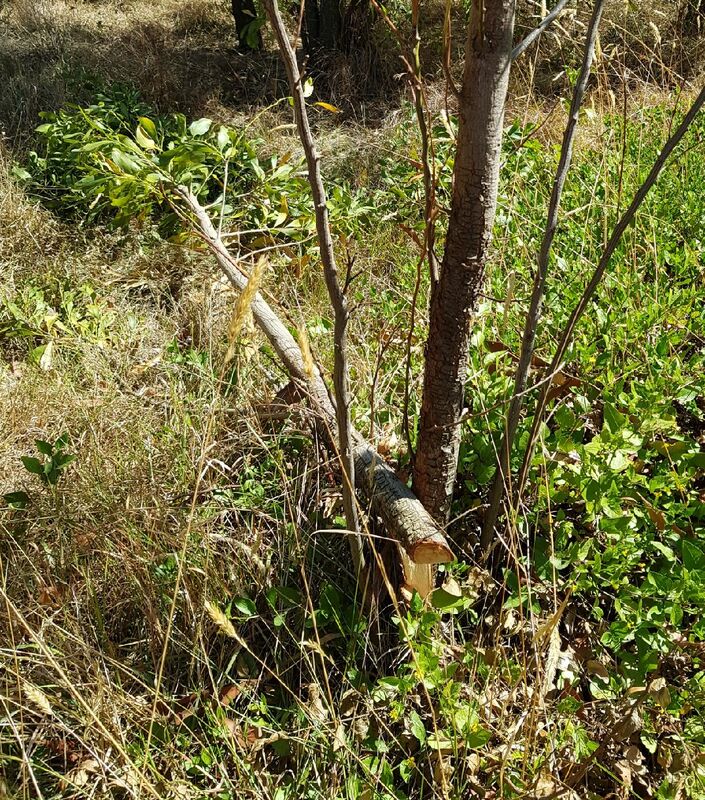 The tree was cut down and left on the reserve. This type of activity is illegal and will be prosecuted if the offender or offenders are identified. Thankfully this doesn't happen very often, and most of our residents do value the Reserve. 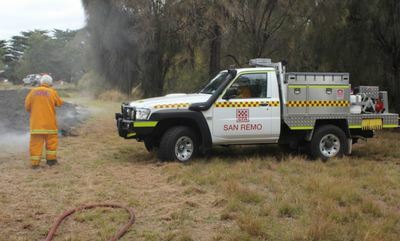 If any further vegetation is cut down or damaged, the committee will consider erecting a large sign in that location until the vegetation re-grows. This has been done in the past, and is common practice in other areas. We hope that there will be no further damage to our foreshore reserve vegetation. Help protect our Reserve. Should anyone have any information about who cut down the blackwood, please refer the matter to the police or the committee. The blackwood tree cut down in the Western Precinct. The 2017-2018 round of Boating Safety and Facilities Program has now opened. The committee are now preparing the application for funding of the ramp upgrade. Applications close on 22 March 2018, and an announcement on successful applications will be announced by the Minister "as soon as possible" after the closing date. 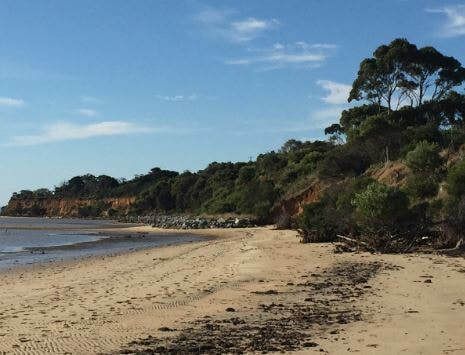 Grants are open to applications for boating safety and facilities projects across the state of Victoria, and will be granted on merit basis. Check the Ramp Upgrade Project page for progress. 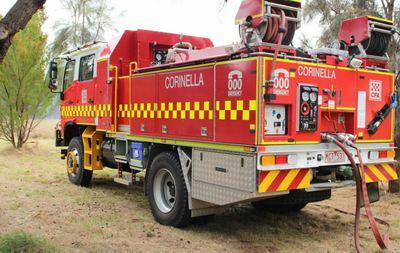 2017 has been a busy and successful year for the Corinella Foreshore Reserve Committee of Management. The new committee was formed at the end of 2016, and has focused on implementing the directives of the Corinella Coastal Reserve Management Plan. Achievements include continued work towards the Boat Ramp Upgrade, several community consultation sessions, a community information session about various aspects of the foreshore reserve, and ongoing maintenance and management of the caravan park, boat ramp area and our beautiful foreshore reserve. The full report is available for download (right). ​The committee wish to thank the Corinella community for its support and participation in events and working bees. 2018 Working Bee dates will be published soon. Final Working Bee for 2017 a chance to celebrate! 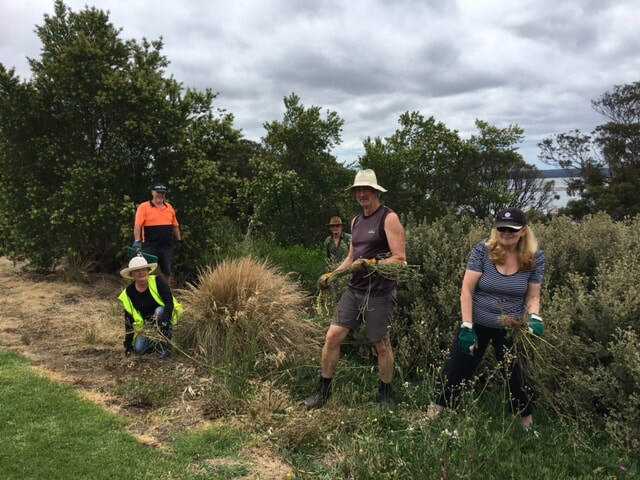 The last working bee for the year saw 10 enthusiastic volunteers work along the Esplanade for 2 hours in great weather. It is amazing how much can be achieved by willing workers in such a short time! 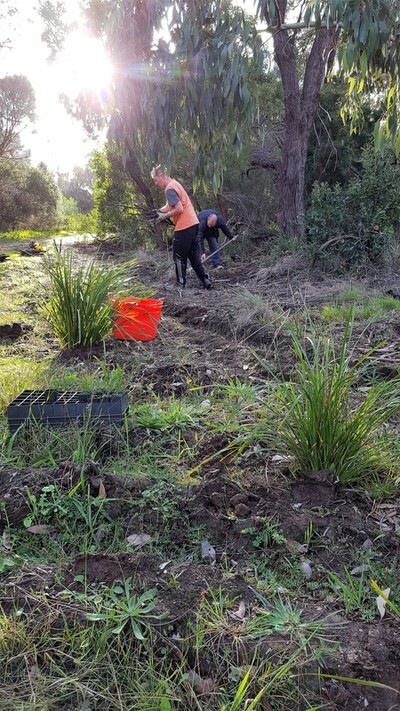 Most of the work was pulling weeds near the roadside edge of the reserve between Albon St and Bowman St, and the end result looks awesome! 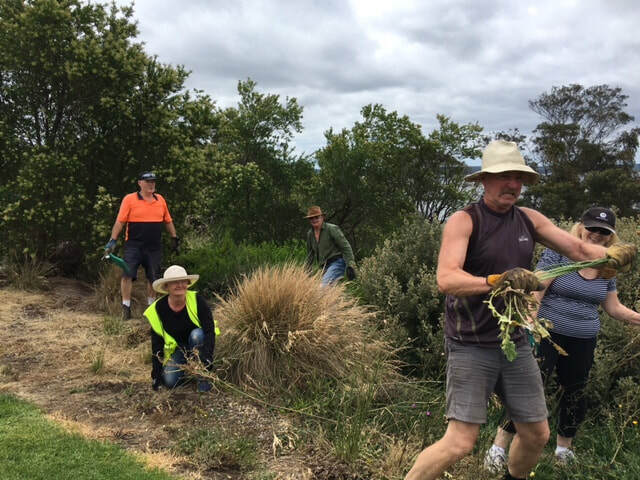 Some of the weeds were well over a metre high, and many were going to seed, so good timing to remove them. 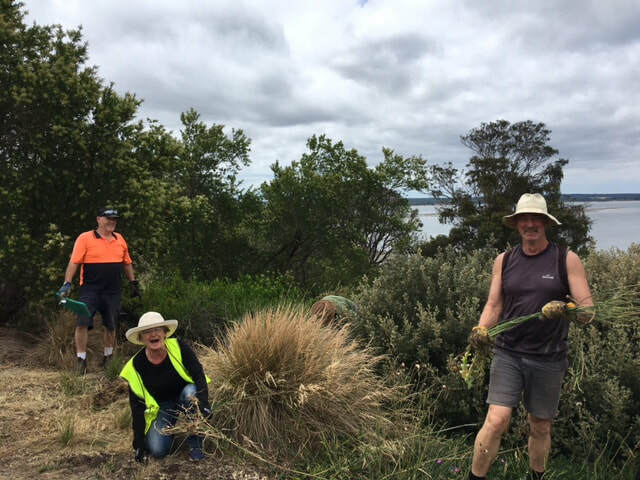 The committee supplied well earned food and drinks for all at the end of the day, to celebrate another year of involvement in our beautiful foreshore. Many thanks to all those who helped on the day, see you again next year! 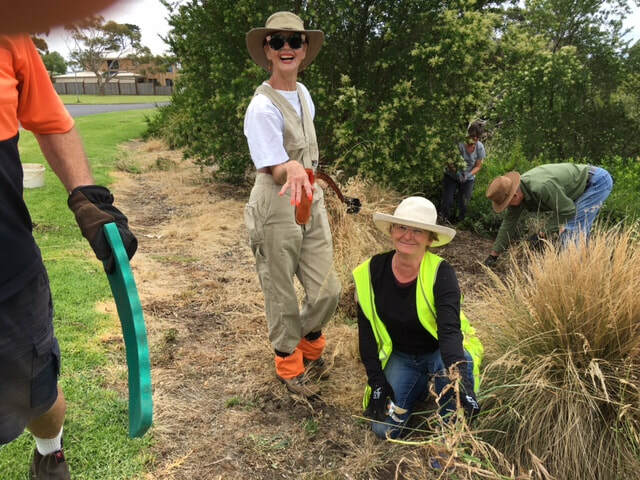 We are always keen to have more community minded volunteers on board - for future working bee dates and locations, check our website. 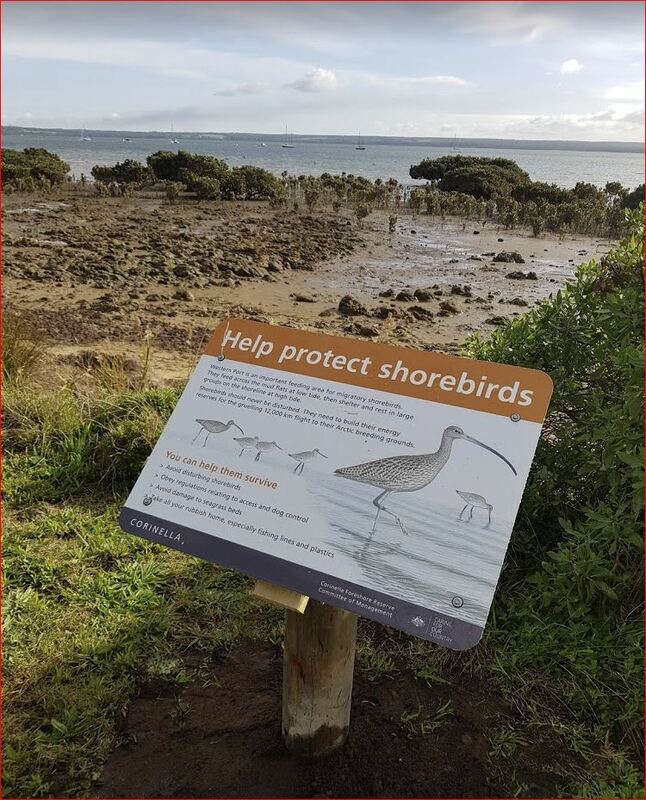 Walkers may have noticed a number of new signs along the Northern precinct walking track to help protect our vulnerable birdlife. 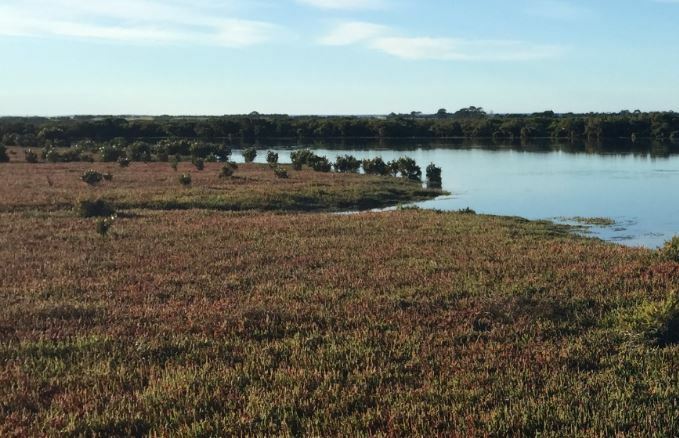 This area is a well-known nesting area for many bird species including the black swan and is globally recognised as a RAMSAR wetland. 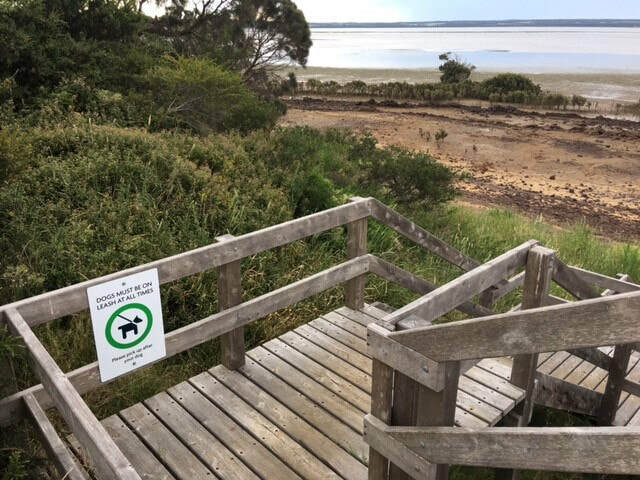 This area has always been an on-lead area, however dogs are often seen running loose along the shore, with potential to attack birdlife including nesting swans. 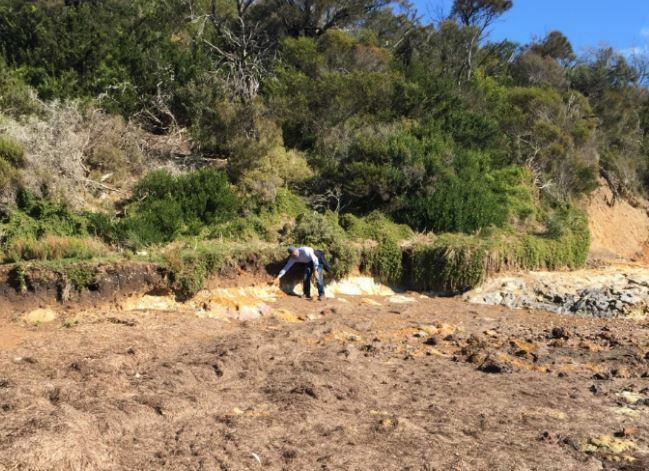 There is a large area of off-lead beach where dogs are able to run free and play on the other side of Corinella. 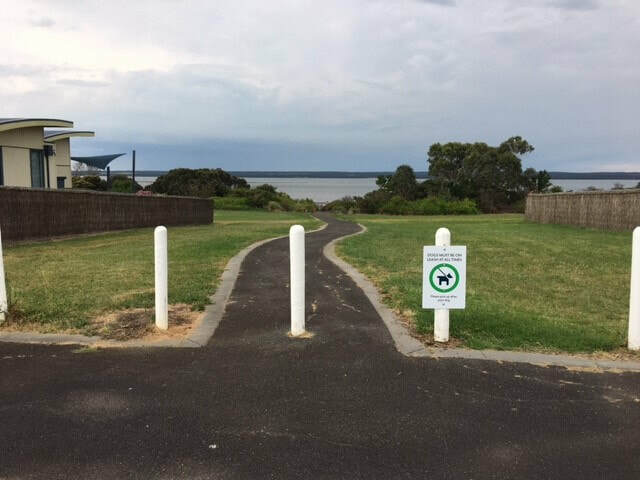 Dog owners are encouraged to use this area to exercise their dogs, and it is also a beautiful walk along the beach. 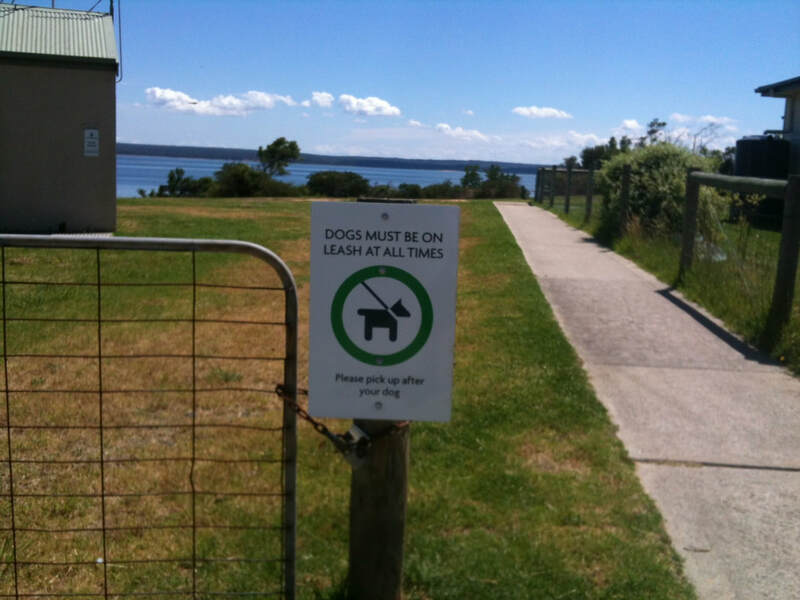 Check the Foreshore Reserve page for off-lead details. 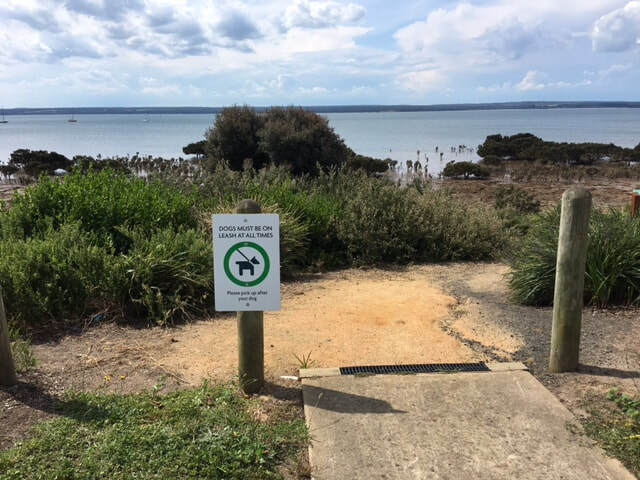 Further to the Councils announcement on 22 June 2017 regarding changes to horse access to the beach at the end of Norsemans Road, they have now made available details about planned improvements for access and permit information on their website. ​The new permit system comes into effect on 1 December 2017. The Committee recently met with the Corinella Boating and Angling Club committee to do a walk-through of the proposed ramp upgrade. Meeting at the ramp area, the group discussed the location of the new ramps and finger-jetty. 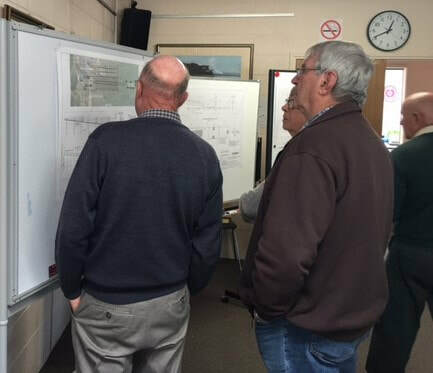 They discussed ideas about the fish-cleaning facilities which will move to land-based stations adjacent to the ramp area. ​They also inspected the corner cutback and provided valuable feedback on further work to be completed in the area. 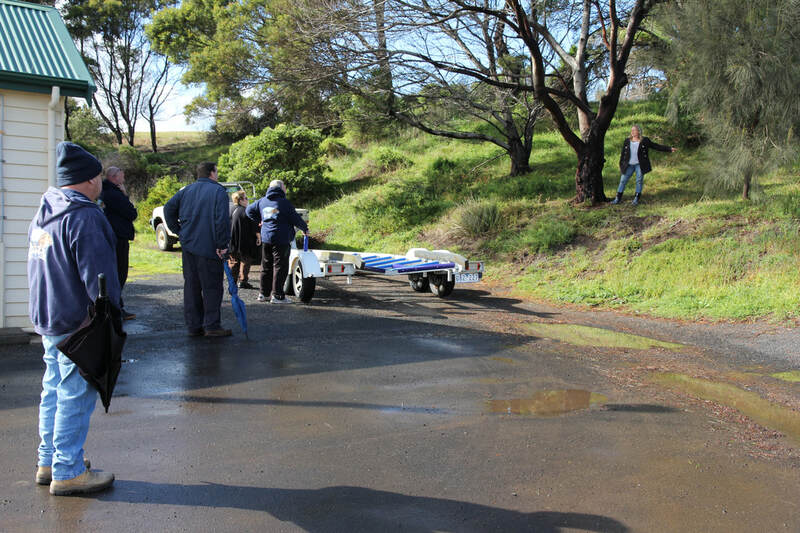 Around sixty people, many from the boating fraternity, attended the Ramp Upgrade Information Session on Sunday 17th September 2017. The session was the final presentation of the ramp upgrade Master Plan prior to the application for funding the works. 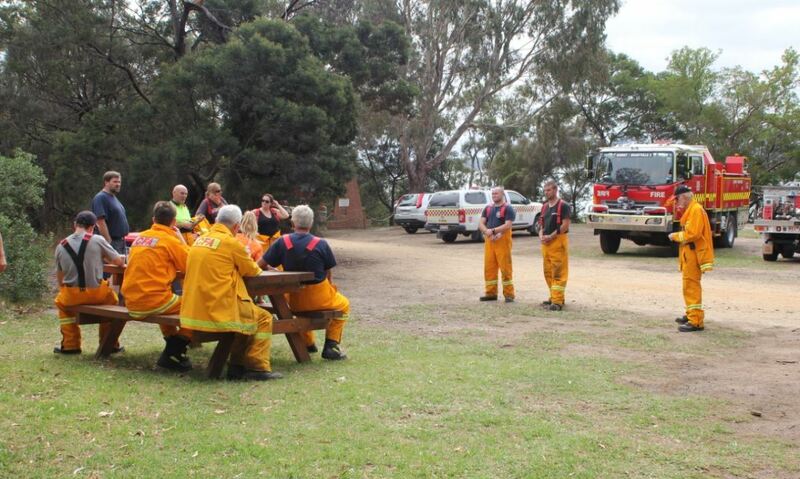 Pamela Rothfield, Mayor of Bass Coast Shire Council,was also in attendance. 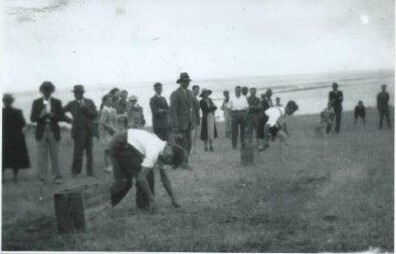 Attendees were treated to a few photos of the history of the Corinella boat ramp and jetties, including photos of the when the current sea wall was built. 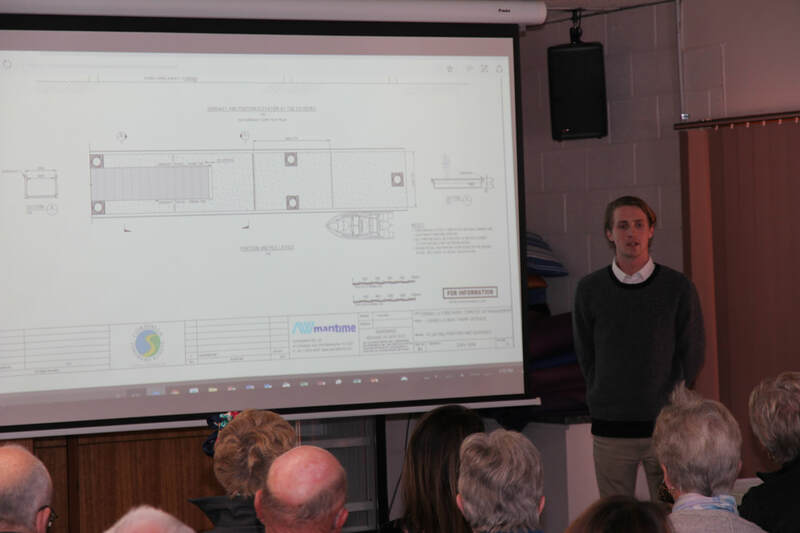 Tom Welleman, an engineer from AW Maritime, presented plans of the new ramps and jetty. ​The new facility will be a 3+1 format, with the the existing western finger jetty retained.A third ramp, new finger jetty and fourth ramp to the east of the existing ramps would be added. Bottom centre: Engineer Tom Welleman from AW Maritime talking through the designs. As soon as the grant application period is announced as open by the Department of Environment, Land, Water and Planning, the Committee will be completing and lodging the application for funding. Funding announcements, successful or otherwise, are expected by January. ​The full presentation is available for download below. Top: Attendees inspect the ramp and jetty design plans. 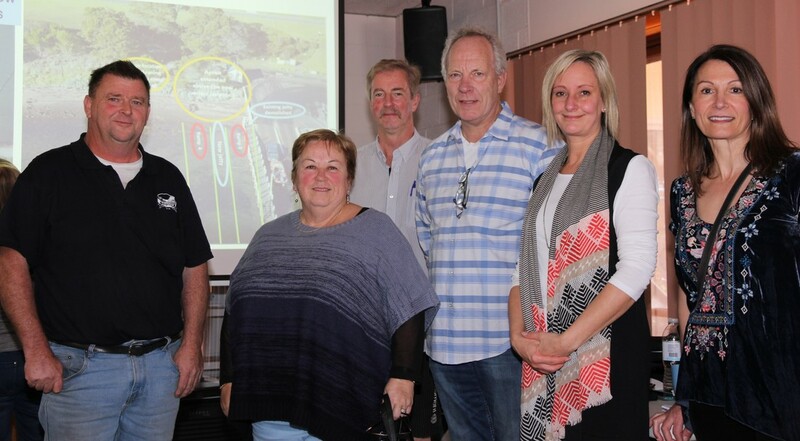 Above: Bob Ricketts (Corinella Boating & Angling Club President), and from the Foreshore Committee are Lyndell Parker, Darryl McKean, Michael Johnson (President & Chair), Gloris Willoughby and Marie Milonopolous. Below: People stayed on to chat and ask further questions, and enjoy a cup of tea and cake. ​Hello, I thought I would share an interesting experience which happened in front of my grandson and myself about 6 weeks ago. ​My 6 year old grandson loves visiting Corinella and this particular morning we decided to walk up to Settlement Point along the cliffside walking track. Before we left I reminded him to be on the look out for kangaroos. During our walk to the “Point” we didn’t see any “roos.”However, we had just about finished our walk having had exited the track at the fence at the bottom of Wright Street, when a noise made us both turn around. There to our surprise.....and only a couple of metres away.....7 kangaroos in “full flight” bounded in front of us. What was truly surprising was that they did a “circuit” in front of us, bouncing around the bio gardens, crossing over the walking track, bounding through the bush “cliff side”of the track before appearing in front of us again. And then, amazingly they did it again! But later, I got thinking about how quickly the kangaroos disappeared from view once they crossed over into the bush. It was almost like they weren’t there and that their circuit antics had never happened. From this experience I saw first hand how important it is to preserve and maintain these areas of bush to protect not only small animals but larger ones such as the kangaroo. 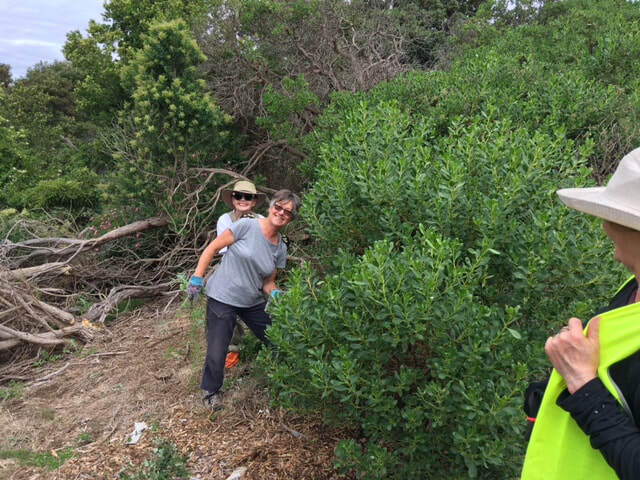 And lastly I feel it is very important that we make every effort possible to ensure that these areas of bush remain and hopefully make provision where areas of bushland join together to create bush corridors so animals can safely move from one area to another. 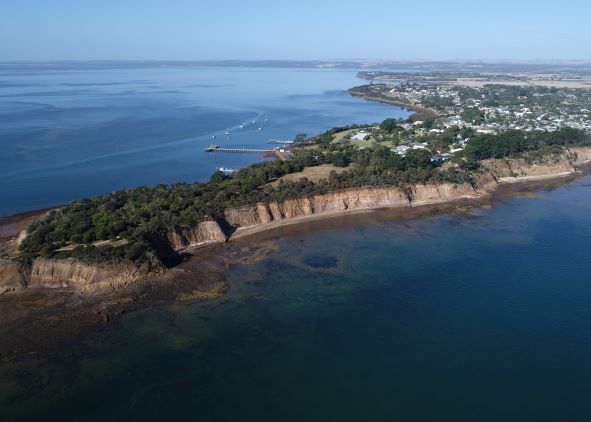 With new housing developments popping up in Corinella, this in the future may be a bit of a challenge particularly when developers push for housing near the sea along with the added expectation of sea views. 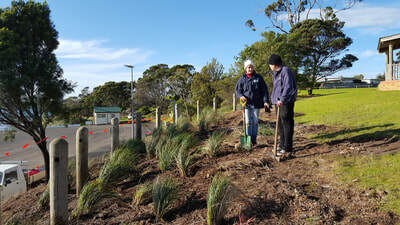 ​Many thanks to the members of the Foreshore Committee. Please keep up your good work in protecting this wonderful little piece of Victoria. 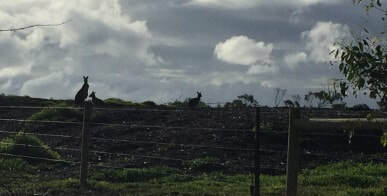 Kangaroos can often be seen around the cleared development sites adjacent to the foreshore reserve. As Meg points out, the reserve provides some refuge for them. 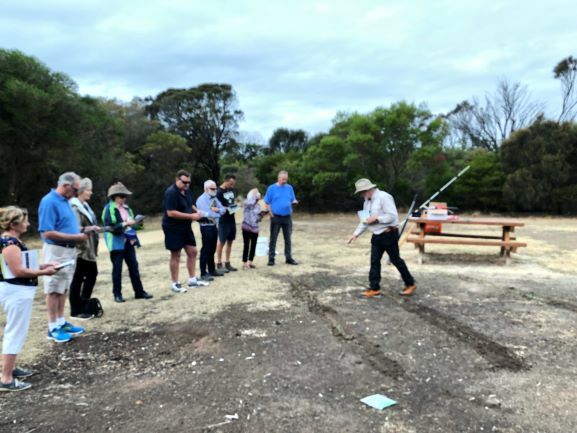 Over 70 members of the community joined the foreshore committee in welcoming four expert guest speakers who took us on a journey through four very different aspects of our fabulous foreshore and its management. 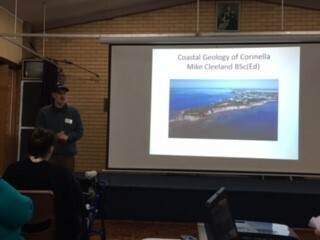 Mike Cleeland (Paleontologist, Geologist and Educator and lifelong Phillip Island resident) told us about the geology of Corinella and wider Westernport area, and learnt that Corinella was formed as part of the same volcanic land mass as Phillip Island millions of years ago. Alison Oates, (local botanical ecologist) covered the botanical aspects of the area and how our environment has regenerated since early settlement. 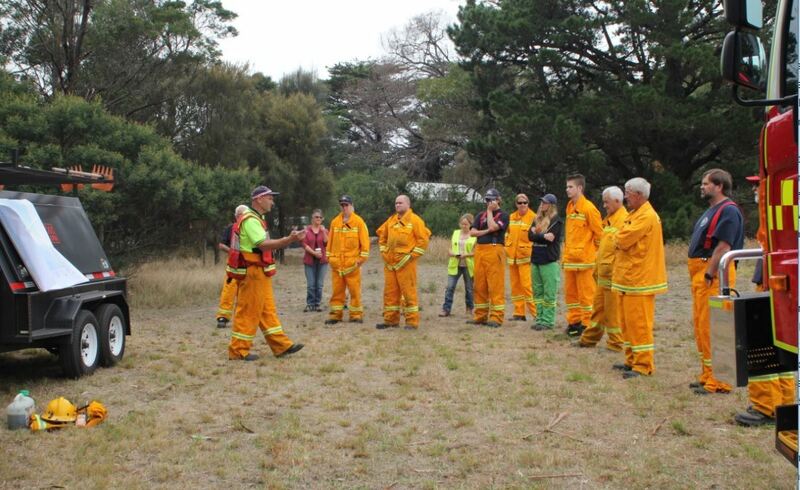 Peter Merritt from the Gippsland Forest, Fire and Regions section of the Department of Environment, Land, Water and Planning gave an overview of the management of the foreshore reserve, foreshore committee structure, roles and responsibilities. The morning concluded with a presentation about birds by renowned bird illustrator Nicolas Day, who has resided at Tenby Point for 30 years. 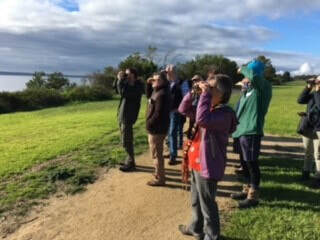 After lunch, many stayed on to go on one of three walks through the foreshore reserve to experience first hand aspects of birdlife, plants or geology of the area. The Foreshore Committee would like to thank our speakers for a fascinating day, and the Church Guild for a wonderful lunch of home made soups, tasty sandwiches and freshly made cakes enjoyed by all. ​The presentations are available to download below. Almost 50 people attended the second Boating Facilities Upgrade consultation session on Sunday 21st May. Wayne Hill, a maritime activity specialist, led the session, with input from Jeff Atkins, maritime engineering consultant. 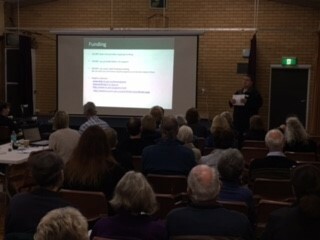 The session included a workshop seeking input from attendees on what’s important, issues, ideas etc to ensure robust review and consideration of the needs of all stakeholders which include boaties, anglers, residents, the public who use the area etc. A third and final session will be held later in the year prior to the grant application being finalised. The plan will include a staged approach in case the full allocation (approx. $1m) is not granted immediately. Following approval, a tender process lead by the Department of Environment, Land, Water and Planning, will be run for the works contract, and a winter build is anticipated in 2018. Corinella Foreshore Reserve Committee of Management was proud to see four long serving members recognised for their years of volunteer service. An awards ceremony was held on Saturday 13 May 2017, hosted by Department of Environment, Land, Water and Planning (DELWP). 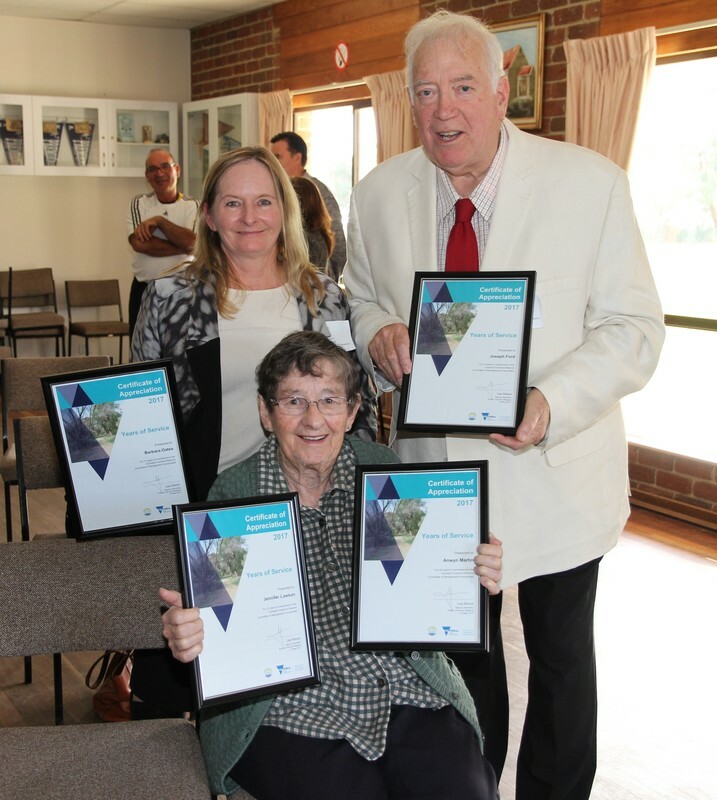 Volunteers from similar committees across the Gippsland region were awarded Certificates of Appreciation by Carole McMillan, Regional Manager Land Planning & Approvals. Anwyn Martin was recognised for 29 years of service, Barbara Oates for 17 years, Joe Ford for 16 years and Jenny Lawson for 12 years. A great effort and cumulatively, 74 years of service in maintaining the foreshore reserve! 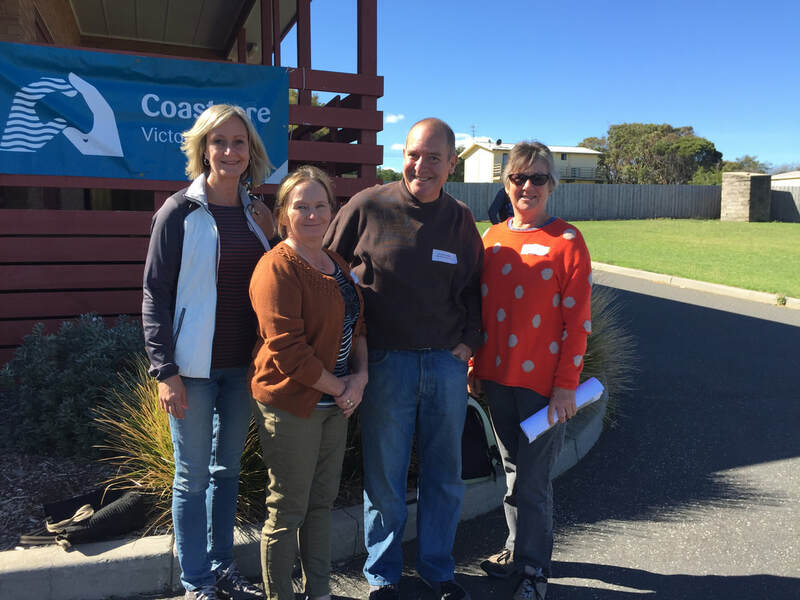 Committee members Barbara Oates, Jenny Lawson, Lyndell Parker and Gloris Willoughby attended the recent Coastcare Victoria Volunteer Forum in April 2017. Held on Phillip Island, volunteers from many similar organisations from across Victoria attended. The forum agenda included speakers from a range of backgrounds (geologists, senior rangers, environment managers, botanists, marine experts, and others). There were also guided field trips to local sites of environmental significance. 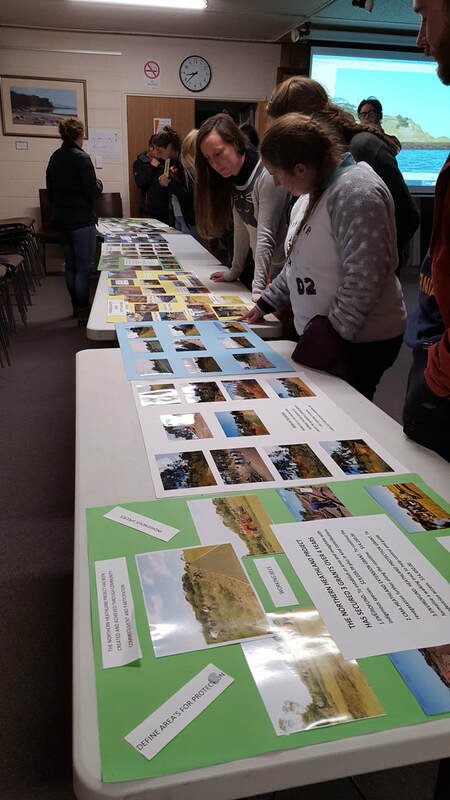 The field trips were an opportunity to hear from the experts on conservation measures, revegetation programs, geological changes which affect our environment, and opportunities for ‘citizen science’ to contribute to research and benefit our environment. 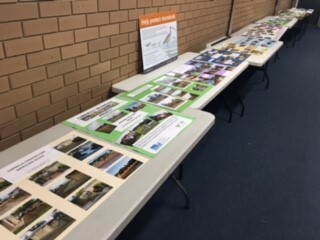 The forum was an opportunity to reconnect and share experience and learnings, to help inform planning for our foreshore reserve. Corinella Caravan Park was host to Neville Rosengren BCom,MA (Hons) Melb,DipAppGeol RMIT, TSTC and 11 earth science students completing their studies. 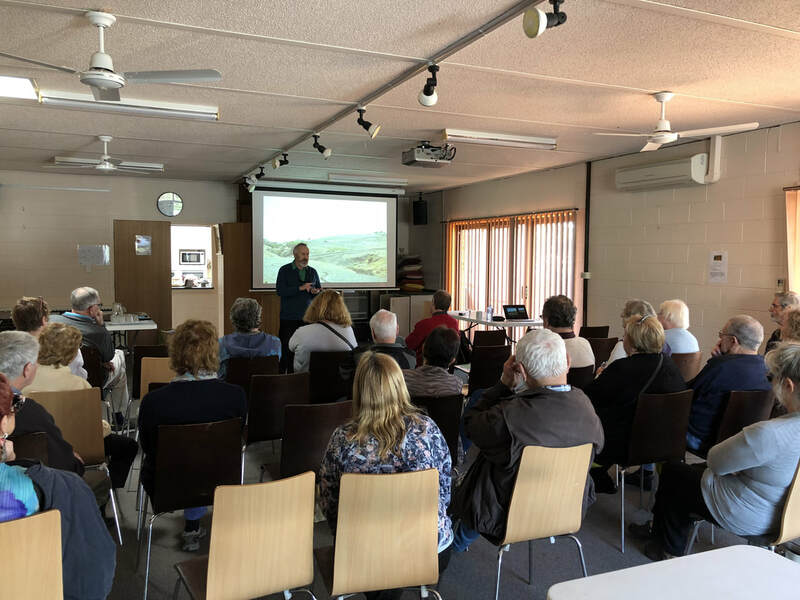 Corinella Foreshore Committee were able the give them an insight to reserve management and environmental challenges whilst sharing recent photos and drone footage of the cliffs. 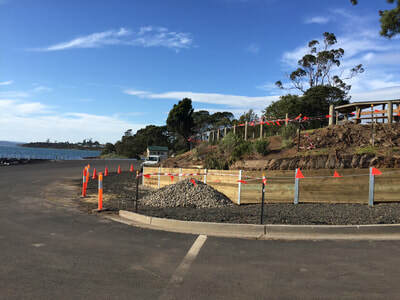 ​For status of progress see the Ramp Facilities Upgrade Project page. What: Currently some people are accessing the rock platform below the Settlement Point cliffs via informal tracks. This is causing erosion and is also unsafe to do. The Committee advise members of the public to access the rock platform from the road at the barge landing area in the interim.